Travelling numpties again and this came off the printer in Mark and Dani’s Internet cafe in Sant Eularia on Ibiza. Well, it very nearly didn’t come out of the printer. How do you say in Catalan “I seem to have got a paper jam”? Then a delighted smile as we saw that this was one of Ifor’s. These clues were generous and it didn’t take long to confirm Ifor’s membership of the tipsy Listener setters’ tippling club with his ‘Almost blended, so turned out whisky(4)’ ALMOST less SO anagrammed, giving MALT, then ‘Oz dog better giving up halves of bitter, maybe? (4)’ Does he even feed his dog bitter? (I once knew a ski-ing Ozzie dog but a tipsy setter of the non-Listener kind?) Ah, no we’re in Wizard of Oz country – it’s that TOTO dog. Looking at the surface readings of the clues we couldn’t help noticing two things. 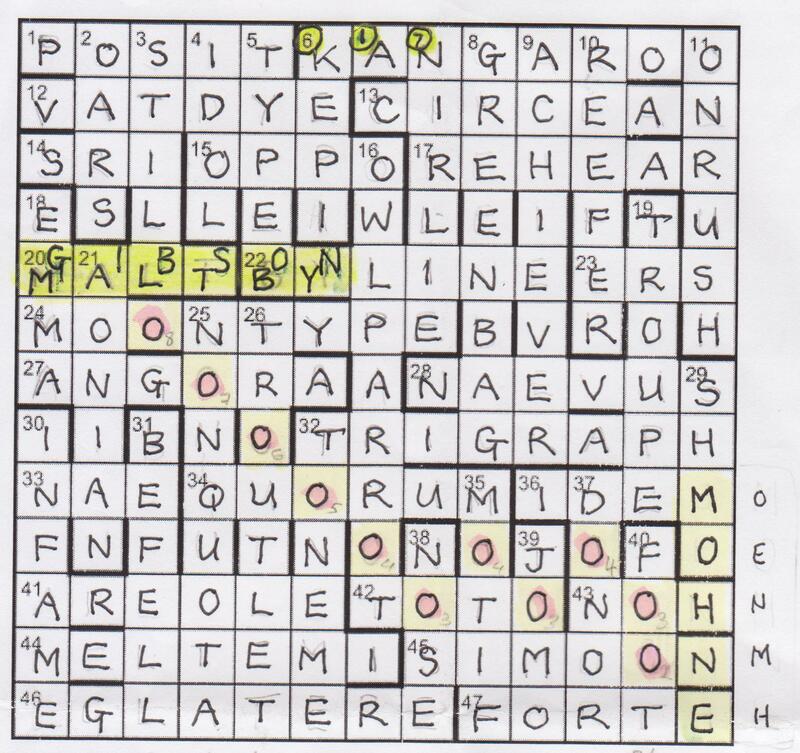 Some familiar names appeared, Maltby and Gibson, and there seemed to be an unusual number of clues that tallied with what that was hinting at; ‘Unit breaching position with fourth from Maltby (5)’ POSI + [Mal]T[by] = POSIT. Wasn’t Maltby the fourth bomber of 617 squadron (the Dambusters) and the one to breach the MOHNE dam? ‘Utter surprise in build up — try again (5)’ REHEAR, ‘Arranged time — maybe Gibson to lead aerial blast in the east? (7)’ MELTEMI What a sneaky trick to lead us on a red herring chase after a different Gibson (MEL) with TIME anagrammed = MELTEMI. It’s astonishing how many of the clues were thematic. We had things climbing, slamming, being thrown out, turning turtle and freewheeling, deploying lifebelts – and they were not disheartened at No 10, either, so the theme seemed to be what we suspected. What’s more, a lovely line of bouncing Os was appearing and heading towards what was clearly a demolished MOHNE dam. Weren’t we all reared on this series of events that has become a national legend (stirring stuff that overlooks the fact that over half the human victims were prisoner-of-war slave workers). Operation Chastise happened just weeks before I was born but I understand my US friend who was quite mystified by the references and equally by a young crossword setter who doesn’t sit through the interminable repeats of the film with that well-known march and found the theme difficult to identify. A full grid then – or almost – the usual handful of doubts – did we need SIMOOM or SIMOON at 45a? Well, the endgame resolved that when we reconstructed the dam and needed SIMOON. MALTBY would clearly become GIBSON, too, producing the required ‘nominal replacement’ of the preamble. How chuffed Ifor must have been when he realized he could make a Ximenean grid with both of those adaptations and only real words appearing in the final grid. One triumphal playing of that march for Ifor. The error was that we were attempting to work out the message after removing only eleven clues with Os. It took me a good hour of flailing to understand that both ANGORA and NON-QUOTA had lost Os and, therefore, that both counted as clues to be ignored. REPEAT ONE ENTRY NUMBER SIX PLACES EAST; It was after midnight when I finally understood that it was the 1 that had to move ‘EAST’ to give 617 – the ‘Unit breaching position with fourth from Maltby’. 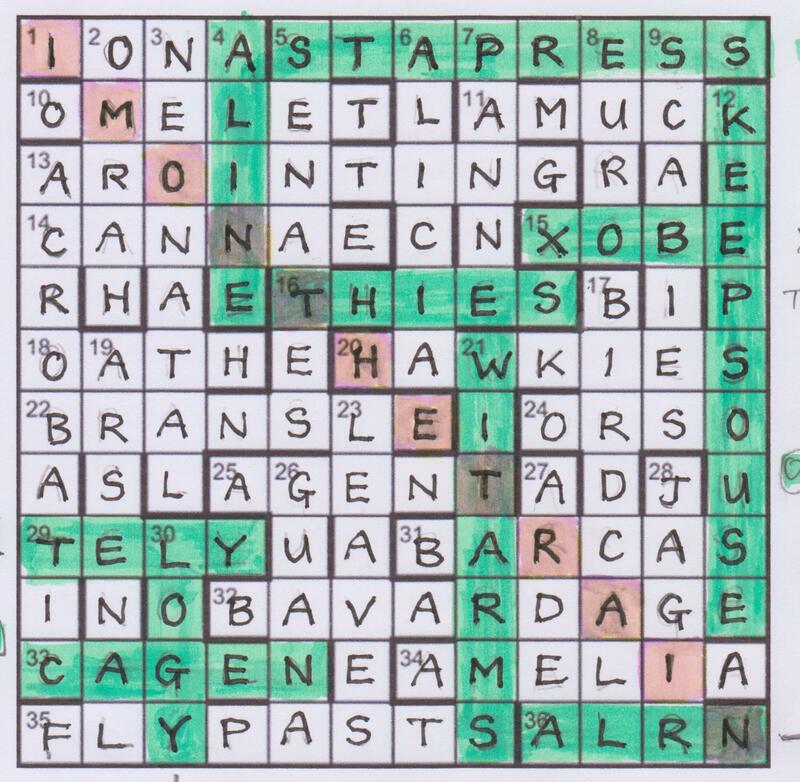 How beautifully this all came together in the end and what a multi-faceted crossword. Many thanks and congratulations, Ifor. Nutmeg! Great! A lady compiler and one we frequently meet in the IQ, EV and Magpie series too. We never find hers easy but we know that they will be fairly set. ‘Forlor…’ Sounds like a quotation from Keats’ Ode to a Nightingale (ironic – ‘the very word is like a bell’ was how Keats continued it – we got our bells later – in a way). We’ll have to wait and see. Oh but these clues were tough! IONA went in quickly, ‘Human back on Moon, a hallowed landing place (4)’ (IONA = IO + [M]AN (rev) and, ‘Unnatural conception on island out of control (5)’ AMUCK (A[I] on MUCK). For a moment, we wondered whether Nutmeg was going to provide a whole set of clues on Scottish islands, but it was not to be. SCABIES produced an NZ island ‘Complaint about tree in South Island’ (with the I of Island rather strangely providing the extra I – SCABIES = C + ABIES in S[I]). There wasn’t a lot of Listener setter tippling going on but Nutmeg was obviously being evicted from the pub in ‘Potentially swift announcement: “time” at disorderly local (8)’ (BIRDCALL = BIRD + L[O]CAL* ) What a beautifully deceptive surface reading! GUANA, JAGIR, ARDEA, HAWKIES – we teased out some tough solutions that were new words to us (as usual, this week’s conversation stoppers “Ha ye caaed the hawkies tae the knowes yet?) and a peculiar set of extra letters was appearing MOTI?BAS…….COTARREGA (We wondered whether we were in another CZOLGOSZ situation!) Stranger still, we were expecting to find ten answers that ‘must be altered before entry into the grid, reflecting a wish of Nutmeg’s which, alas, is likely to remain unfulfilled’. We had a vague suspicion that that was going to be a FORLOR[N HOPE] but didn’t jump to the obvious conclusion at this stage. Now we saw why TE?? had eluded us. ‘Letter rewritten when short of time not genuine communication (4)’ A PHONE had been thrown out of the solution. (TELEPHONY = LETTE[R] less T* + PHONY with PHONE* – mobile so anagrammed – removed left TELY). This was some compiling! Was Nutmeg going to be able to remove ten ‘mobile’ PHONEs in this way? The clues that had been resisting us now began to yield and we slowly teased out: A[NOPHE]LINE, STA[NHOPE] PRESS, X[ENOPH]OBE, THI[OPHEN]ES, C[OPENH]AGEN, AL[PENHO]RN, WIT[H OPEN] ARMS, [NEPHO]LOGY and KEEPS [OPEN H]OUSE. I still haven’t understood the word play of that last one and clearly either O would fulfil our purpose. The constraints must have been massive when Nutmeg was attempting to fit all of those into the grid. We hadn’t finished yet, either. We still had to make sense of that strange message that the extra letters had produced. A few were missing, and, with typical Numpty back-to-frontedness we had our solution so it was purely academic whether we worked it out (or probably was – you can never be sure with the Listener, those letters might say cut your grid into little mobile-phone-shaped pieces and throw it out of the train window). We slept on it. Morning brought daylight! MOTIF BASED ON GRAN VALS BY FRANCISCO TARREGA. That sound that regularly disturbs our peace in public places was apparently composed by Tarrega, a well-known classical guitarist! I’ve commented before on how much we learn with every Listener solve. How did Nutmeg know that? Perhaps she’ll honour us with a setter’s blog and we’ll find out. Many thanks, Nutmeg, that was quite a challenge and great fun! This was Nutmeg’s fourth Listener, following on from themes of Franglais, Winnie the Pooh and The Grand Old Duke of York. For some reason, I had it in my mind that Nutmeg puzzles were of average difficulty, but a check of previous LWO blogs indicates otherwise. Winnie the Pooh’s Unsettled Spell in May 2011 took me well over 4 hours. Here, Nutmeg had a wish that was likely to be unfulfilled. 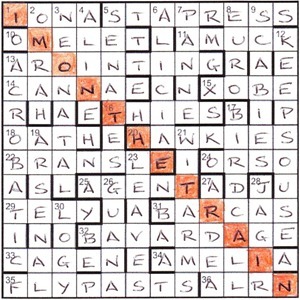 The clues had an extra letter in the wordplay which would spell out a message revealing a reason for this wish and would be reflected in the method of entry of ten clue answers. 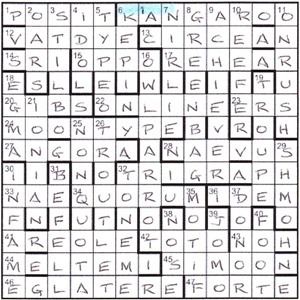 The last across clue was number 36. 34ac Being short of members, support group welcomes graduate priest (6) was the first that I solved, and I only got that by looking up legless in Mrs B where the first word was AMELIA! 36ac looked as though it was a jumble of PLANE followed by some sort of short coat, and ALPENHORN was squashed and squeezed into the four squares.This was obviously the first of the ten answers needing treatment, but I would need more help before that became clear. Mrs B assisted again with 13dn Agile rugby player almost dances enthusiastically (9), giving ACROBATIC — BAC[K] in ACROSTIC – S, with C as the extra letter. I think this clue illustrates how tough this clue type is, since the BA really bears no relationship with the rugby player. I’m not saying that it’s unfair, just that it’s not surprising that I get so few answers in my first pass through the clues. My barely superficial knowledge of football helped with 19dn, with NE< in [T]ARSAL giving ARSENAL. If only 21dn The Paris woman dances enthusiastically (7, three words) had been as obvious, but the fact that it was a 3-word answer of only 7 letters hinted that it was likely to be one of the clues needing treatment. It was also probably an anagram of ‘the paris woman’ minus one letter. WARM HOT SPAIN + E was the first attempt I had, and I looked out the window at the wind and rain and wished I was in Spain playing golf. WITH OPEN ARMS didn’t reveal itself for another half hour. Similarly STANHOPE PRESS at 5ac (an anagram of SPO[O]NERS PET HAS) was some time coming. Luckily ANOPHELINE was solved reasonably early and IONA at 1ac and OMELET at 10ac meant that it was probably to be entered as ALINE. It looked as though a jumble of PHONE had to be removed, but that didn’t really help to explain what was going on. It was the message produced by the extra letters in the wordplay that was needed to help with that, and as the puzzle progressed they seemed to be making less and less sense. France and Scotland looked like they were there together with ‘grand’, and I wondered whether it was Nutmeg’s wish that grandchildren living in France moved closer to the setter’s home in Scotland! It seems that the Gran Vals was the melody on which Nokia based their (in)famous mobile ring tone: daddle-a-dah dadle-a-dah daddle-a-da-da! And Nutmeg’s Forlorn Hope was eventually shown to be a world with no mobile phones with the phrase “Honey, I’M ON THE TRAIN” being consigned to history! My only disappointment with the puzzle, Nutmeg, was that you couldn’t weave OENOPHILE into the grid. That would undoubtedly have made Shirley’s day!